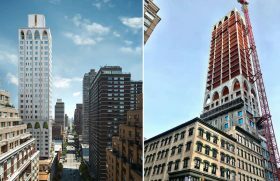 The highly anticipated tower rising at 180 East 88th Street recently topped out, taking the title of the city’s tallest building north of 72nd Street, as CityRealty first reported. Developed by DDG, the 524-foot structure will bring 48 expansive condos to the Upper East Side and is expected to open this Spring. Photos from a recent construction visit show crews adding the final pieces of the concrete-enclosed rooftop bulkhead. Crews are still working to fully cover the facade of the 32-story tower in hand-laid Kolumba brick (there are 593,987 individual bricks) which will be accented by bronze-colored window frames. 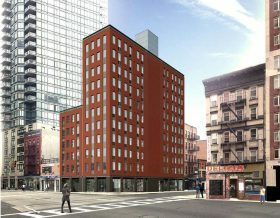 At the corner of Second Avenue and 92nd Street, just a few short blocks from the Second Avenue Subway, Extell Development has completed their first all-affordable housing project. Located at 1768 Second Avenue and designed by Curtis + Ginsberg, the development is comprised of two separate buildings, one 11 stories and the other six stories, for a combined 28 units of below-market-rate housing. These units are reserved for households earning 70 or 80 percent of the area median income, ranging from $1,018/month studios to $1,740/month three-bedrooms. 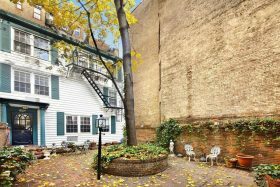 A little over a year ago, 6sqft discovered a listing for one of three co-op units at 229 East 81st Street, a rare 19th-century white clapboard house. This duplex was listed for $695,000 and recently went into contract for $500,000. Now, the one-bedroom unit on the first floor has also hit the market, asking $499,000. In addition to the house’s magical patio and prime Yorkville location, the apartment benefits from several skylights, modern appliances, and a spacious layout. Unless we’re talking about a “sleeping loft,” it’s not that easy to find a true one-bedroom on the Upper East Side for under $1 million, but this charmer at 335 East 90th Street offers that and so much more. The completely renovated duplex not only has a large open living/dining area on the upper level, but below, it boasts a bedroom, bonus room, and 660-square-foot landscaped backyard. Pre-war touches such as exposed brick and a wood-burning fireplace remain but are complemented by modern built-in storage, a sleek kitchen, and contemporary spiral staircase. 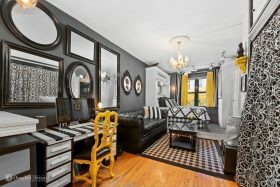 In the heart of Yorkville, this cozy co-op studio at 203 East 89th Street doesn’t offer a ton of square footage, but a $335,000 ask, daring design (hope you like black, white, and yellow! ), and plenty of southern light–plus proximity to Central Park and other Upper East Side perks–make it worth a look. Yorkville has been a popular outpost for the young professional crowd for quite some time now, but thanks to the Second Avenue Subway opening two years ago, the neighborhood has been getting on everyone’s radar. 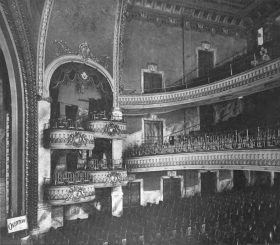 But long before the cool subway mosaics, new building developments, and constantly-popping-up restaurants and bars, Yorkville had a diverse history that spanned more than 300 years. In celebration of this history, FRIENDS of the Upper East Side Historic Districts is releasing today a new neighborhood history book, “Shaped by Immigrants: A History of Yorkville.” And after getting a sneak peek, we couldn’t resist sharing some juicy neighborhood history gems. 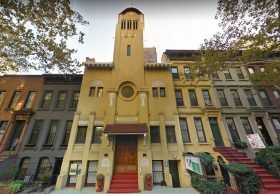 From having its own “piano ferry” and the largest brewery in the country to revolutionizing apartment living, this Upper East Side enclave is bursting with exciting secrets! Gracie Mansion, the gracious Federal-Style mansion that overlooks the East River from Yorkville’s Carl Schurz Park, has been New York’s Mayoral residence since 1942. 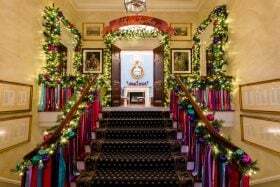 But the house had a long history before it started hosting municipal magistrates. 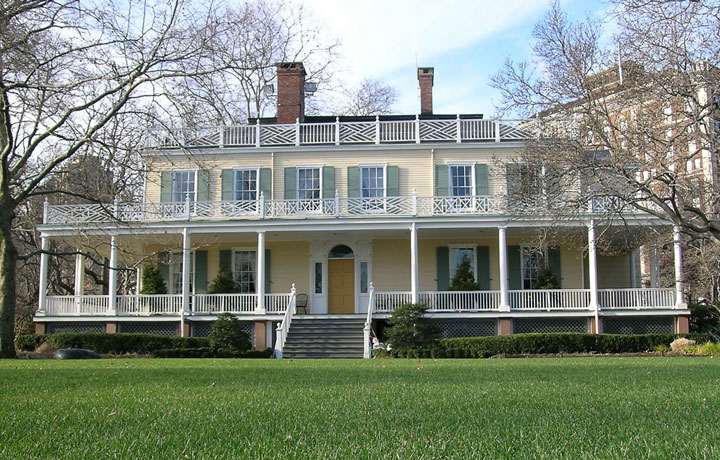 Since construction began in 1799, Gracie Mansion has served as a residence, a museum, and even an ice cream stand. 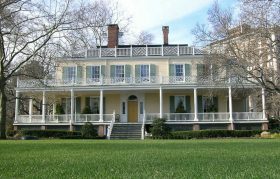 From a connection to Alexander Hamilton’s death to the stubborn mayors who refused to live in the residence, here are 10 secrets of the People’s House.